Hey readers! My name is Annabelle or shortly Anna. I am living on the estates my whole life now and herited the stables und facilities from my granddad. I am the owner of the estate and the horses. Mostly I do organizational stuff, but I also like to train the horses. 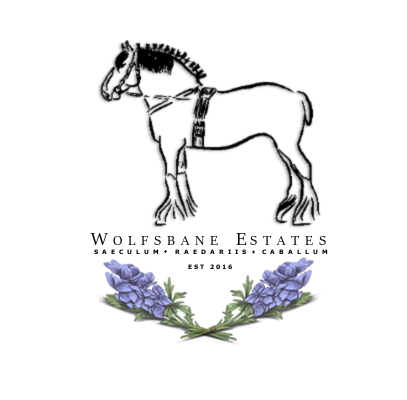 I usually use to train the Shire Horse Wolfsbanes' Sir Henry and the Stallion Wolfsbane's Welcome To The Jungle. Besides that I am helping the other staff members and also like to work with our young horses. Hey guys. I am Ella Fletcher and I am originally from South Africa, from a little town called Weenen. I am the daughter of an Englishman and a South African and I started riding at very young age. But mainly I was educated and trained for Racingsports, what I did till an accident. After that I immigrated to England and did an education for a trainer in english riding. After an announcement that Family Wolfsbane searched for a new trainer I applied for the Job and got it. I mainly doing light training with the broddmares, but I am also responsible for a few stallions mainly in eventing sports. Hello dear readers! My name is Wiebke and I am currently working as a trainer for the stables. I am originated from Düsseldorf in Germany, but came to work here in Delamere. I am an educated horse trainer from the German FN for English-riding-sports and combined driving. I met Anna and her granddad at an international Show where I worked back then and after I finished my education Anna asked me whether I would like to work here. Obviously I said yes and neve regret it."